Syfy's Incorporated may have been intended as an obvious, futuristic dystopia, with its scary super-corporation, but lately it's been feeling like it could be set just a few years from now. The first season is coming to an end on Wednesday, Jan. 25, and knowing this show, there's a good chance that it will leave us with a major cliffhanger. Unfortunately, Syfy has not yet announced whether Incorporated Season 2 will happen, though that is common for the network. While according to Showbuzz Daily, Incorporated's ratings are just about average for the network, its big name producers, Matt Damon and Ben Affleck, should help it earn a renewal. If there is a second season, it likely wouldn't premiere until the end of 2017, since the series first premiered in November 2016 and has yet to start producing more episodes. However, ratings aren't the only reason to keep a series around. There's also great casting, which Incorporated absolutely has, and an interesting, relevant storyline. In fact, Incorporated could be the most relevant series of the past year, thanks to its themes of political resistance. The fictional Spiga Biotech is the biggest company on Earth and functions like a government, exerting control and oversight over citizens' lives. And not coincidentally, there's been an economic collapse that left most people desperate to work for the very company that helped orchestrate the situation. In a time when in real life, many people are economically struggling in some way, this is a good reminder that corporations don't always necessarily have the people's best interests at heart. At least, it does by showing how hard it is to resist the control of a totalitarian state without legal protections. Climate change: it's real, and could have serious ramifications for the world at large. Incorporated takes place in 2074, and by then, huge swaths of the Earth are uninhabitable, considered "Red Zones," which is a sobering reminder of the importance of protecting the environment. Aaron, aka protagonist Ben Larson, is actually a refugee on the run from a Red Zone scheming to bring Spiga Biotech down. Considering the way refugees have been talked about in our real political climate lately, the fact that Incorporated portrays a refugee as its hero fighting for what's right shouldn't be overlooked. While it's not particularly revolutionary to have a subplot where a woman is trapped in sexual servitude, Incorporated does show how vulnerable populations like women can be forced into bad situations under economic oppression. In the end, what's really propelling Ben is his desire to find his lost love, Elena. He's helped by her brother and one of his biggest vulnerabilities is his wife, who's part of his disguise. Ultimately, if he succeeds, it will be because love motivated his resistance. 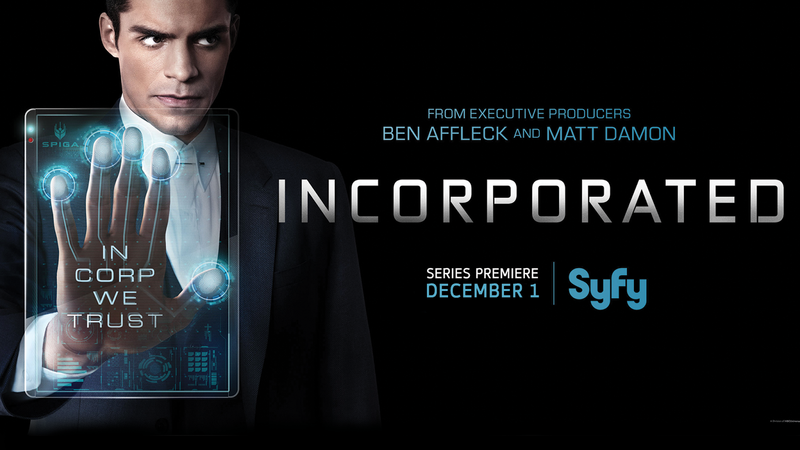 There are a lot of reasons to love Incorporated and hopefully, enough for Syfy to renew it for a second season.